In this episode, I'm joined by indie film distribution expert, Peter Broderick, as we explore the lessons learned from the New World of Film Distribution. How does an independent filmmaker make a profitable and sustainable living as a filmmaker? This one fundamental question led me down a path where I was discovering that the traditional ways of making and selling films were changing dramatically. This also changed how filmmakers made money. This is the big question: What happens after you’ve finished making your film? It wasn’t enough for me to just blindly enter my films into festivals and cross my fingers and hope that I would be discovered. I needed a better strategy. I needed to understand the end game better. The end game being distribution. This all leads to Peter Broderick. In September of 2008, Peter wrote an article for IndieWire entitled, “Welcome to the New World of Distribution”. 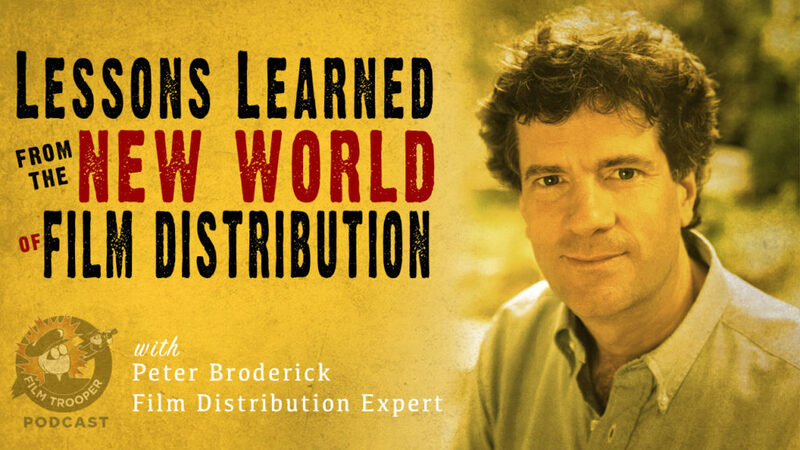 In the article, Broderick compares what we would normally refer to as traditional distribution as the old world vs. what was coming in fast as the new world of distribution. 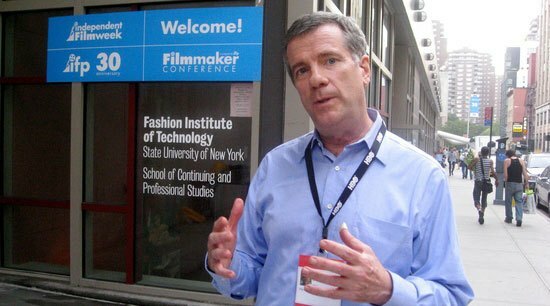 Between 1997 and 2002, Peter was the President of Next Wave Films, an IFC company. They provided finishing funds for independent films. One of the films happened to be Christopher Nolan’s “The Following”. After the Following, Nolan of course went on to make Memento and the Dark Knight trilogy, etc. Why Do Film Investors Want To Be The Last Ones? A side note on finishing funds or financing. In the world of indie film, when you’re trying to get investors to invest in your film and you hear the term finishing funds or P&A funds. 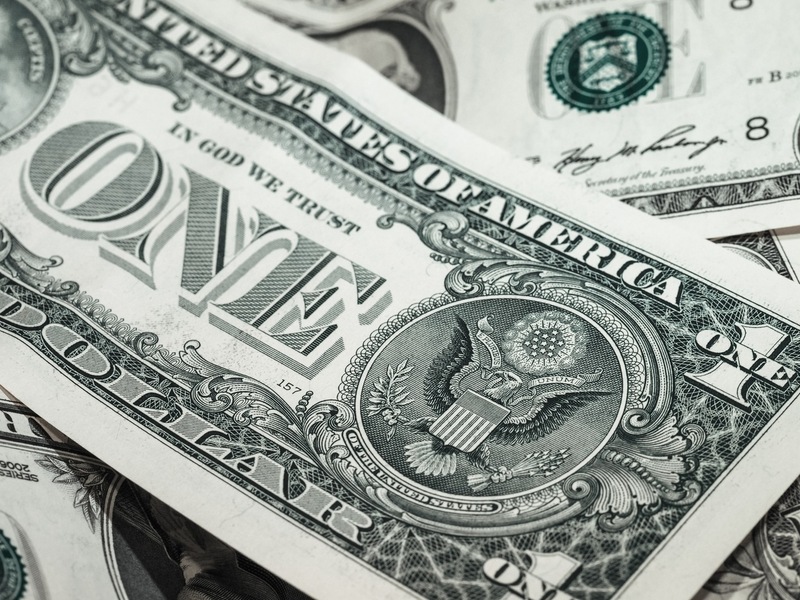 This usually means money that comes in at the end of production, to help in post-production costs, or in the case of P&A which stands for Prints and Advertising money. Prints would be the high cost of actual prints made from the film negative. Then those prints, in film cans or canisters would be shipped from one theater to another. This is quite expensive to do. But wait, you’re thinking, isn’t everything digital now? Why not just send a Hard Drive or provide a link to download? Well, yes. This is what is happening now. But the term P&A is still used. Now, most of the money goes to “A” the advertising funds. Here’s the important part of the finishing or P&A funds. When an investor comes in at the end of your project and decides to hand over money to help you finish and pay for advertising, most savvy investors will want to recoup their money first, ahead of all other investors in on the project. This is commonly known as “Last one in, first one out”. Let’s take a look at the film Snowpiercer starring Chris Evans, Captain America himself in a quirky SciFi film made by a South Korean director. The film was reportedly made for $40M. But it still needed additional funding for the P&A. The film was initially financed by companies in Korea and Canada. Radius, a boutique label from the Weinstein Company picked up the distribution deal for Snowpiercer. Normally, a film made for $40M would have to make $80M to make it’s money back. Why? An additional $20-$40M is required to be spent in the P&A budget outside of the production of the film. SO, that’s why $80M is needed just make their money back. This is, of course, a distributor is trying to make money from the traditional distribution model, where they would have to split the revenue 50/50 with the theater owners. But when this film was released it was released on VOD at the same time it went into select theaters. The revenue split is usually around 70% going to the distribution company, and 30% going to the VOD platform. Snowpiercer only made about $4.5M in theaters domestically and was reported to make $6.5M in digital. $11M domestic revenue. Remember, this film had a South Korean director. The film made about $87M in international theatrical revenue. Now where does, Radius TWC fit into all of this? Being that they were the “last one in … they get to take their money out first.” So depending on how they structured the deal, they could have only put in $10M for P&A, while all the other investors ponied up $40M to make the film. Yet, these investors who put money in first will have to wait to get their money back after the Weinsteins get their share. It’s possible that the Weinsteins made that money back in the domestic revenue alone, without having to put anything into the domestic P&A. They probably contacted the press and announce that they were doing day and date, meaning that they’ll play the movie in a few theaters and release it on digital VOD at the same time. At the time this was news worthy. Newsworthy is FREE press, no Advertising spending needed. They probably paid a minimal fee of $2,000 to get the film onto iTunes and other VOD platforms. $4.5M made off a $2,000 aggregator fee? That’s pretty good. Why $4.5M? That’s 70% off the reported $6.5M VOD gross. Now once the Weinsteins made their investment back, they can start collecting a percentage of the revenue for profit, while all the other investors have to wait in line to eventually get their money back and then earn profit sharing. Bottom line is that the smart savvy film investors that stay in the business, pretty much become finishing fund and P&A investors. Last one in, first one out. Does The New World of Film Distribution Work? Back to our story with Peter Broderick and IFC’s Next Wave Films providing finishing funds for independent films between 1997-2002. During this time, the old world of distribution began to crack in the wake of the new world of distribution thanks to a technology disrupter, the internet. Broderick witness this changes and when IFC came to shut down Next Wave Films for the simple fact that the advance monies in distribution deals started to dwindle and instead of adapting to the changes, IFC got cold feet and just closed shop. This didn’t stop Peter from helping filmmakers navigate the changing landscape. As you’ll hear in the interview, Peter began giving talks about the changes and this led to filmmakers hiring him. A few years ago, a documentary team, made up of two guys, Keith Ochwat and Christopher Rufo hired Peter to help them craft a strategy to self-distribute their documentary, “Age of Champions”. Back in episode #77, I had Christopher Rufo on the podcast. I’ll most likely rebroadcast that episode soon. 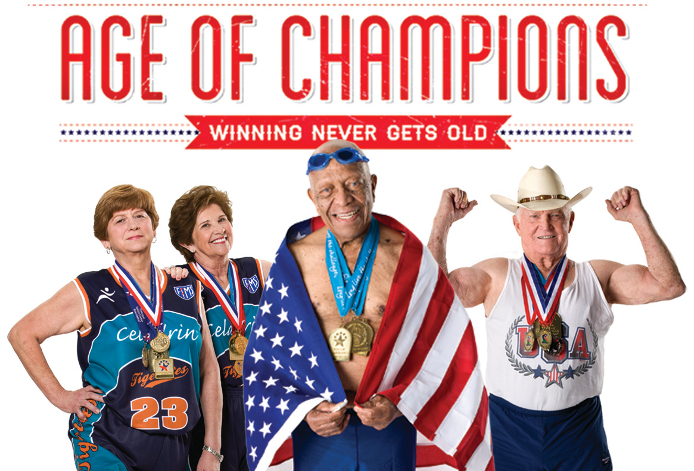 The big takeaway here is that Rufo’s film, “Age of Champions” was a documentary that followed a group of senior citizens competing in the Senior Olympics. They did the festival tour and nothing happened. Not distribution deal, nothing. In two years of self-distributing the film and applying the advice that Peter gave them, they made $1.5M in two years off their film. Remember, there were only two guys. They net almost $400,000 each for their efforts. They are the glowing example of filmmakers actually making a living from making their films. Peter coined the term “Hybrid Distribution” in 2005. 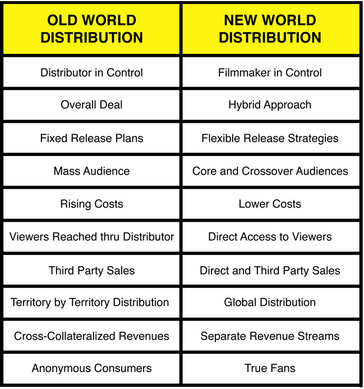 Other prominent indie film distribution advocates, like Jon Reiss, have also starting to use the term hyrbid distribution as the future for all indie filmmakers looking to build a sustainable living making movies. Broderick is the President of Paradigm Consulting, a company that helps filmmakers and media companies develop strategies to maximize distribution, audience, and revenues.